Photo caption: The Fourth Annual Food Fight gathered 1430 food items for the Hancock County Food Pantry plus $130 in cash donations from several local businesses and schools. The Bay-Waveland Elementary School gathered the most food items (435) for the second year in a row. difference in how the Food Pantry is able to help families in Hancock County. Community organizations in Hancock County donated a total of 42,577 pounds from over 25 individual food drives. Schools donated 11,566 lbs, businesses 10,275 lbs, individuals 13,554 lbs, civic groups 5,004 and churches donated 2,178 lbs. Donations to the Post Office Letter Carriers Union Mother’s Day food drive across the county totaled an additional 20,606 pounds. Most of these donated food items from the community are canned and dry food items that are the usual menu items the Food Pantry gives to families every day. These donations allow the Food Pantry to “stretch” the supply of purchased food even further and serve additional families. The Hancock County Food Pantry also received 82,733 pounds of donated food in 2012 from the Walmart Supercenter in Waveland and two area military bases. The food from Walmart alone totaled 30,834 pounds and is received via a partnership program with Feeding America. These food donations are items not usually found on the menu of food that families receive from the Food Pantry, and so all of these donated food items are additional food given to families. Some of these donated food items include frozen meat, produce and bakery goods that the Food Pantry could not afford to purchase to give away to families that need help. Food Pantry has provided free food to over 206,000 Hancock County citizens. Fit First Gym in Bay St. Louis, MS recently hosted the 1st Annual Fit First Turkey Trot 5K & 1 Mile Fun Run to benefit the Hancock County Food Pantry. Over 300 runners participated in this event on Thanksgiving Day in downtown Bay St. Louis. The participants felt it was a great cause to cross the finish line for. Helene Loiacano, owner of Fit First and director of the Fit First Turkey Trot, presented the $3,000 check to Ed Catone, Executive Director of the Hancock County Food Pantry this week. In addition, the racers donated over 1,700 pounds of food the day of the race. With food costs going up, there are more and more people going to the food pantry. Fit First and the race participants feel it’s important to give back to the community. The annual East Hancock Elementary food drive netted 2,447 items for the Hancock County Food Pantry. This is an increase from last year’s food drive. Mrs. T. Wilkes’ class brought in the most overall items donated with 267. Mrs. M. Weissbohn’s class came in second with 227 donated items. Those two classes will receive a pizza party sponsored by the PTO. Within each grade, the class with the most donations will be also thanked with a popsicle party sponsored by the PTO: Kindergarden was Mrs. H. Lafontaine’s class; 1st grade was Mrs. S. Murray’s class; 2nd grade was Mrs. J. Courtalt’s class; 3rd grade was Mrs. S. Gerald’s class: 4th grade was Mrs. A. Seay’s class and 5th grade was Miss D. Dainello’s class. The annual food drive is a long standing tradition at East Hancock Elementary School. Pictured is Mrs. Wilkes’ class with the 2,447 items collected in the food drive. In the photo: Ed Catone, executive director of the Hancock County Food Pantry, receives a $5,000 grant check from Rich Westfall, president of the Gulf Coast Community Foundation and Alan Sudduth, Chevron public and governmental affairs manager. ​ enlightening and enriching day for everyone," said Spain about last week’s check presentations. Hollywood Casino Bay Saint Louis today awarded a $500 grant to the Hancock County Food Pantry on behalf of the Penn National Foundation. Leslie Patrick, Senior Director of Human Resources for Hollywood said, “We are proud to provide support to the Hancock County Food Pantry as they are an important partner in our community.” Since opening its doors in 1986, the Food Pantry has provided assistance to over 200,000 Hancock County residents. 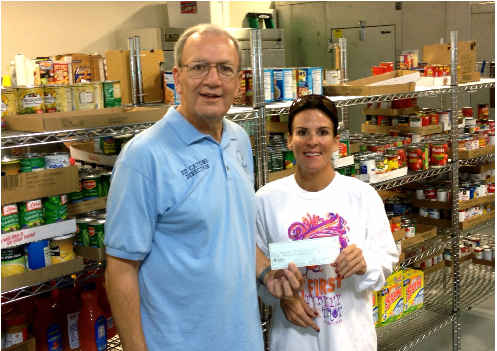 Patrick presented the check to John Wittliff, Treasurer for the Hancock County Food Pantry. “Foundations provide over one third of the funds the Food Pantry spends on food for Hancock County families each year, and we certainly appreciate this $500 grant from Penn National Foundation,” said Witliff. The Penn National Foundation was launched in 2005 by Penn National Gaming, Inc., Hollywood’s parent company, in the wake of Hurricane Katrina to provide assistance to those impacted by the storm. Today, the Penn National Foundation is proud to support numerous local non-profit organizations in the communities in which Penn National operates. U.S. Postal Service carriers recently collected nearly 11 tons of food for the Hancock County Food Pantry, exceeding any previous food drive in the 25 years of its existence. Pictured above are Pantry workers Pat Jarrell, Reid Walker and John Smuck with approximately one-third of the total food collected. Jarrell, Walker and Smuck - along with Dough St. Amant - loaded, transported and unloaded the food in less than two hours. HCFP Executive Director, Frank Manchester said the food will feed about 500 facilities of three and will supplement regular pantry supplies well into August. The Hancock County Food Pantry received an unexpected and most welcome donation. A check for $3,500 was presented to the Pantry by local resident, Harold Sanders, on behalf of the CSX Transportation Corporate Citizenship Team. Sanders, a retired employee of CSX, initiated the request for the grant last September. "This was a very timely and generous surprise. It couldn't have come at a better time for the needy in Hancock County. The first of the year is usually the "down-time" in donations following the very generous holiday season." said Pantry Executive Director, Frank Manchester. "Of course we depend upon our County businesses,civic groups,churches and individuals throughout the year; however, the extra financial resourses, such as the CSX grant, will help us to continue the level of service to our hungry families through our leaner months."